The video game legend that put Ubisoft on the map! The only character in gaming history to have no limbs yet he wears a scarf around his non-existent neck, yes I’m talking about Rayman and he’s back in the latest game, Rayman Origins. After the countless Rabbids editions, it’s time for the main character to take center stage but can Rayman capture the imagination of the audience like it did in its heyday? Or will he find out that having limbs are the only way to go!? 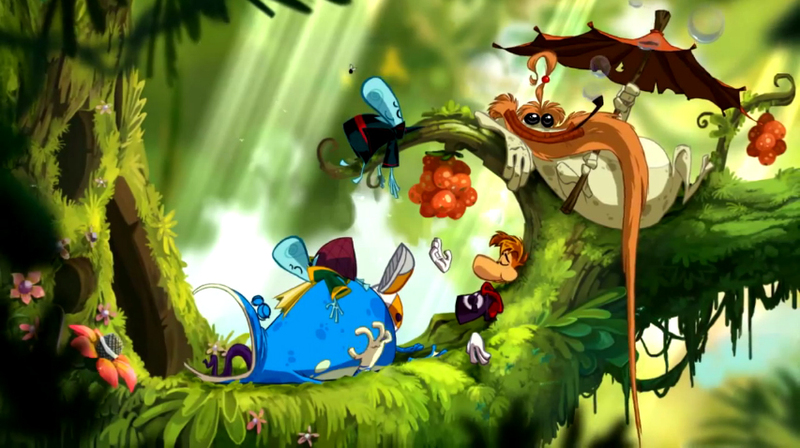 Rayman and his friends, Globox, Teensies and the Old Master are kicking back and taking a nap at The Snoring Tree while below them, residents of The Land of the Livid Dead can’t stand their painfully annoying musical snoring act. One resident in particular gets upset about it and tries to shake everyone awake only resulting in the musical snoring being played even faster and louder. Not being able to take it anymore the evil of the Livid Dead surface and attack Rayman and his crew but regardless of their valiant efforts, they are defeated and locked in cages. Rayman and his friends manage to escape however due to the Livid Dead, the Old Master has gone loco due the Lums being spread all over The Glade of Dreams. 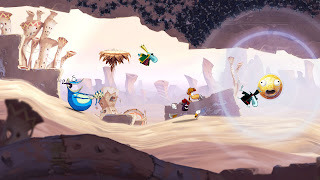 It is now up to Rayman to travel to the different areas and bring those Lums back. Ok in all honesty the story is a very simple one and lacks any kind of detail to push it further. The fact that the game has “Origins” in the title led me to believe that it would be looking at Rayman’s earliest beginnings but according to Ubisoft that idea was scrapped and rather this was treated as a sequel instead. Of course in doing this details become mixed up for example, Rayman’s attitude compared to the earlier games and the fact that you don’t get a feel for the story other than from the parts where the Nymphs are saved. 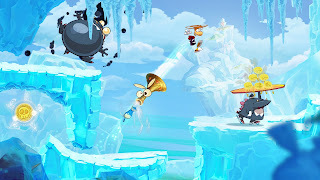 Rayman Origins is a side scrolling platformer with the general basis of the player going through each level, fighting the enemies, picking up the Lums and saving the Electoons at the end. There are also Skull coins which grant you extra Lums and secret areas where you can save additional Electoons. At the end of each level, you’re Lum score is counted and for every target reached, you’re awarded an Electoon. Changing size through levels adds a whole new sense to the gameplay. Throughout levels are hidden Electoon cages which you need to find to complete that level’s medallion. It’s almost a tricky thing judging from the fact that the player may become completely oblivious to them while running through a level filled with adrenaline however they themselves are really simple to spot, you just have to listen out for the cry of help. 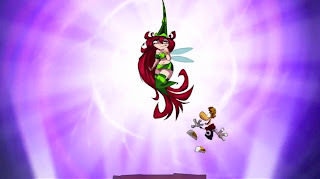 In the different lands, Rayman can gain new abilities such as punching and flying; this can only be done by saving Betilla the Fairy and her sisters who show their gratitude by granting you them. In a way the game forces this because you can’t proceed without saving them however it’s a nice throwback to the original Rayman game. Another big thing about the game is the boss battles which frankly I have to say, I’m really disappointed about. The Boss’s themselves are way too easy to defeat in which the only time you could possibly lose is during your first go at it. There are barely any variations on attacks and the battle is practically over just as it gets started. Betilla the Fairy has been given an updated look! The basis of the game has a very simple and easy to understand system that doesn’t force the player to learn new things as they go along but that’s not saying the levels themselves are easy either. At the beginning, yes things will be slightly toned down but as you go along, you’ll find yourself facing what seem to be nearly impossible tasks that need near perfect timing to complete. In short it’s a good progression of difficulty that not only helps the player as they go along but also prepares them for the more difficult tasks ahead. Local Co-Op is where the game pushes its Multiplayer with up to 4 people playing at any one time. Players can control Rayman, Blobox or two Teensies with additional costumes and patterns that become available as the game progresses. What’s cool about this is the way players can just drop in and out of the game without disturbing it for those still currently playing making such a transition seem seamless. Of course I found it awkward that the Co-Op was not implemented online, something which could have truly given the mechanic a bigger presence. Sound has a heavy influence in the game as from time to time you will be hearing some of the most addictive yet wacky tracks every produced but it’s not just the background that gains something from it. Almost everything in the game has a specific sound assigned to it, whether you’re jumping on Lilli pads or bouncing off drums the entire game is practically singing as you go through it. This in turns creates an atmosphere that engages the player more into the action, whether you’re swimming in the deep dark backed by a smooth choir or chasing a treasure box backed by an uplifting Banjo, its true quality that is tied with the Rayman series. Using Ubisoft’s new UbiArt engine, Rayman Origins produces some for the most gorgeous 2D graphics on the HD consoles. The environments are full of life and colour making them a real sight and pleasing to the eye. Textures are sharp, strong and never drop in quality no matter how many players are on the screen at any time. The characters themselves look great and are full of personality whether its Rayman’s best friends or worst enemies everyone has that difference factor which makes them stand out on their own. Rayman Origins is a strong return to form for this particular series. It retains everything that made the original game so great through beautiful environments and amazing sound pieces. Of course it’s sad to see that Co-Op was not included in some form online and the story could have been rounded off a lot better however the characters are full of life, the gameplay is fun and all round is a great title. Had a chance to play the game? Let us know what you thought of it in the comments section below!